As I had a 10.000uF (0.01F) capacitor and was awaiting my supercapacitors, I was wondering if I could perhaps use that, just to carry a circuit through the night. With the aid of a 9 Volt Solarpanel (and a resistor) the 10.000uF capacitor was charged to 10Volts fairly quickly (it was a sunny day). The charge in that can be calculated by 1/2*0.01*10² =0.5Ws. But as we can only use it at 5 Volt level in reality that is 0.125 Ws. Also, as we take 1.8 Volt as our lower limit, we have to subtract 0.0126 Ws, leaving us with 0.109Ws. With the earlier stated power consumption of 13.8uWatt that leaves us with about 7900 seconds or 2 hours and 12 minutes, which is obviously not enough to carry us through the night. As it turned out, my circuit lasted for 1 hour and 25 minutes before it appeared to be dead, which i guess is close enough to the calculation, considering it was an old (>20 yrs) capacitor that might have suffered and maybe had a bit of a leak current. Now before I get criticized that I am not taking into account that the capacitor is also discharged during the day because it has to feed the circuit then as well… yes that is true, but I merely wanted to see if the capacitor could store enough load to begin with, to carry me through the night, which it cant. The charge -and thus the capacitor- would need to be at least some 9 times bigger (so a 100.000uF minimally). I could have figured that all out just by calculation, but nothing beats a field test to see if calculations are right. Anyway, while waiting for my supercapacitors to arrive (aliexpress) I had some time to think about what solarcell to use. 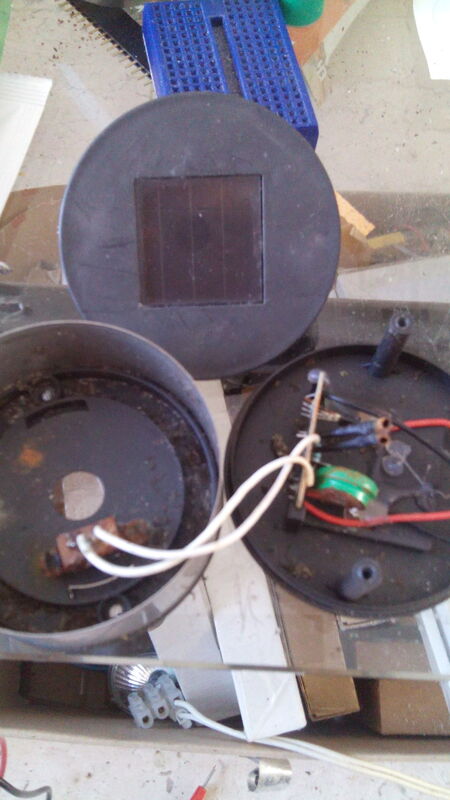 The 9 Volt (5 Watt I seem to remember) seemed definite overkill, but from a few old gardenlamp I had some small solarpanels that delivered 2.5 Volt. I could put 3 of those in series (as they only give 2.5 Volt on a sunny day). I had no idea what Wattage they are but they are used to charge a 1.2V 40mAh NiCad, and some 300mAh NiCad. The latter seemed a better choice. Ofcourse I could buy a solarpanel, but I first wanted to try with what I had available. In part 1 I calculated a 1.5 Farad capacitor at 5 Volt is charged up to 19.5 Joule or 19.5 Wattseconds. So if one wants to charge that capacitor with say a 5 Volt 1 Watt solarpanel one would need a minimum of 19.5 secs to charge it (if we forget about a series resistor for a while). 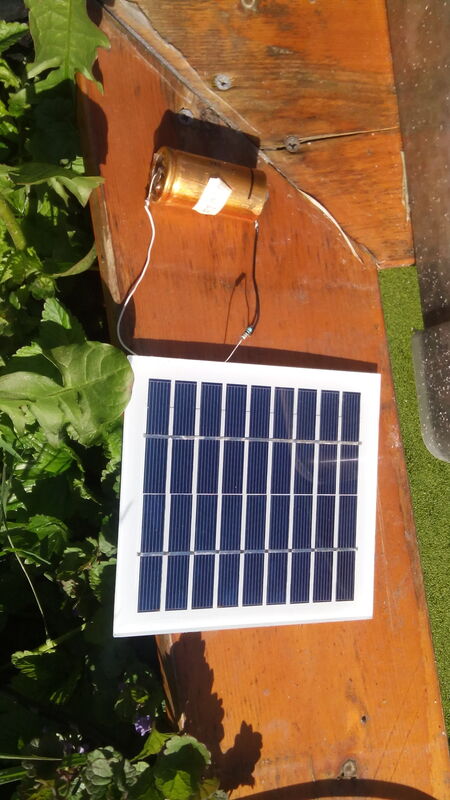 Thriftstores sell these small solar Garden lights usually for less than a euro. They have a small solarcell and inside a circuit build around an YX8018 IC that charges a single NiCad cell. Sometime sometimes a very small one (40mah) sometimes a bigger one (800mAh). They need a full day of sun to charge and at dark an LED lights up for a few hours. Now suppose the small solarpanels from my garden light are indeed enough to charge a 1.2 V 40mAh cell if left to charge for say 8 hrs. The cells are 1.2 *40 mWh =48 mWh. If charged over 8 hrs that leaves a solar cell of 6mW. As the cells give 2.5 Volt in bright sun light, I would need 2 which then gives a total of 12mW (this is just theoretical, it is very low for a solarcell). So if I need a charge of 19.5W.s, that comes down to (19500/12=) 1625 secs or 27 minutes or 0.5 hrs to charge the 1.5 Farad capacitor. That is doable (if we forget about the poweruse in the daytime). In that 0.5 hrs obviously 13.8uW*0.5=6.2uWh is used just for the working of that circuit, which is small enough to ignore in terms of charge time. So, if a 1.5 Farad takes 0.5 hrs to charge, my 10.000uF should take 20/100 m or 12 secs. Lets see. Now before I go on, just a word of warning: the calculations I do are partly limit calculations and do not always take all practical realities into account. For instance, a 5 Volt 12mW cell will be able to deliver 12/5=2.5mA. However if one tries to load an empty capacitor with a series resistor of say 100 Ohm, then the max current that is requested is 50mA, obviously the photo cell cannot deliver that so the voltage drops and therefore the classical natural log curve of charging a capacitor will not be followed. For any given moment the curve will follow the natural log curve for the voltage at that moment, leading to a longer charge time. Just a word: One could use the innards of the cheap garden light so, including the circuit around XY8018 IC to charge the caps, if one brings it up to 5 Volt. Various circuits for that exist. I however decided to keep it simple and do a straight laod from one or more fotovoltaic cells. Nevertheless, as halfway through my experimentations my Ultracaps arrived from Aliexpress (very fast delivery), it didnt seem much use to experiment with the 10.000uF any longer, so in Part 3 We go to the real work. By the way, someone has already done some work on this. No not bad at all. Very interesting article. I would have finished part 3 by now if i had had some time. In the mean time i got 2×1.5F capacitors that do very well, charge them via a resistor and a zener. Not the most efficient but it works well. Interesting to read about the current use of the 433MHz transmitters. Somehow i was led to believe that those transmitters didnt consume that much energy when no signal (eg attiny asleep). Thanks. The 433 MHz transmitters usually have a transistor in series with the oscillator. When that transistor is switched off power consumption is close to zero. For them my powering the transmitter via a micro controller output pin is over complicated.